site's underlying strata (Hawkesbury standstone and possible eroded Ashfield shales). 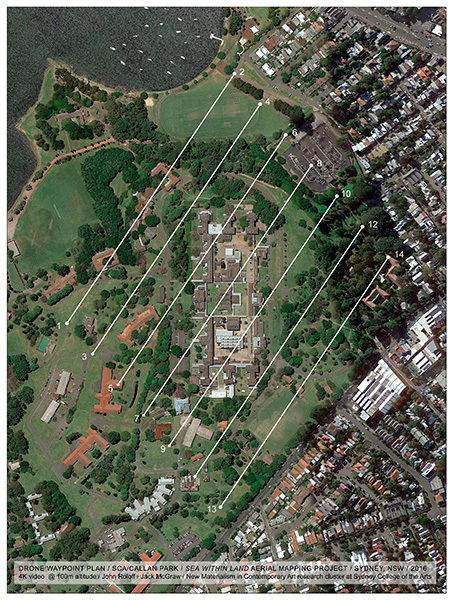 Scan pattern density dependent on altitude and collection instrument capabilities. Optimum altitude of 80 meters above sea level (usgs estimate of full global glacial melt sea rise) / scan pattern to overlap as standard bathymetric practice. Top right: Hawkesbury sandstone in situ unconforrmably overlain with Anthropocene deposits, downtown Sydney. Land/Sea / Hawkesbury Facies is the first realization of a series of urban bathymetric studies conceptualized in 1998 using aerial and submerged multibeam sonar to study the built envrionment in geologic terms. This project was realized through an invitation from the New Materialism In Contemporary Art Research Cluster, Sydney College Of The Arts in Sydney, New South Wales, Australia, to participate in the Future Straigraphies exhibition, lead a master class and keynote talk for a related symposium. Working in collaboration, the New Materialism in Contemporary Art Research Cluster commissioned Jack McGrath to conduct a series of experimental drone flights to study bathymetric visualization possiblilites. Ron Boyd, a marine geologist specializing in stratigraphy consulted on the geologic history of the Sydney area. His information about the fluvial and deltaic systems depositing the Hawkesbury sandstone and Ashfield shale during the Triassic Period that form the main stratigraphic units of the Syndey area, was critical to the project. The paleo-dynamics of the ancient rivers/deltas were plotted as directional vectors for the drone scan patterns that will be used to map the SCA site. This pattern creates a link between the facies and paleo-geography of the Mesozoic foundations of the landscape and the facies/geography of the site's Anthropocene strata as well as potential global, Anthropocene sea level rise. 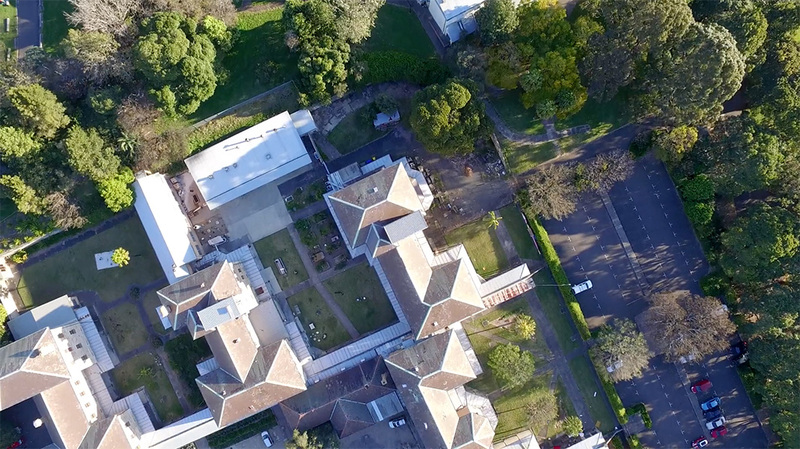 StudyHawkesburyFacies1, an edit of prelimiary drone flights studying possibliities for bathymetric-simulation video scans of the Sydney College of the Arts, Sydney, New South Wales, Australia, site. The optimum drone scan altitude is 80m above sea level, the USGS estimate for sea level change under full glacial melt conditions. The water-overlay segment of the second half of this video is a study for one form of sea level visualization of full glacial melt and the potentiallevel of submergence of coastal cities such as Sydney. 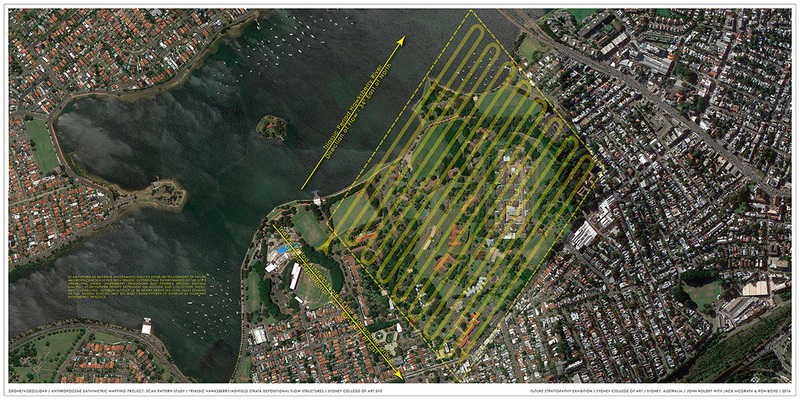 A more accurate video bathymetric-simualtion scan using plotted waypoints as shown above in the diagram, Drone Waypoint Plan / SCA/Callan Park / Sea Within Land Aerial Mapping Project / 4k Video @ 100m Altitude. This video will scan a selected area delineated by vectors describing the flow of the two Triassic river systems that deposited the main stratigraphic units beneath Sydney. The use of video for Phase I and II is a procedural stand-in for multi-beam sonar, the original concept that proved problematic as the transducer-produced sound signal of the sonar does not work in a subaerial enviornment, only in a aquaeous envrionment. 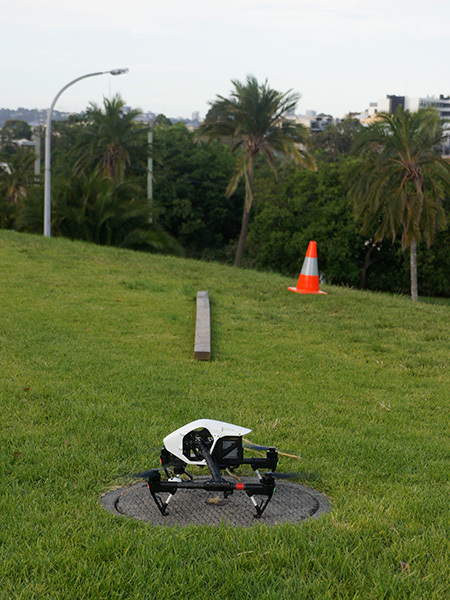 To more accurately simulate a bathymetric scan of the site and related sites at a later phase of funding, drone-based scientific-level LIDAR visualization is being explored. LIDAR uses lasers in a similar way to multi-beam sonar sound waves produced by transducers.